Large, dramatic openings bring transparency and contrast to the 10-inch-thick concrete facade, framing perspectival views of the landscape. Douglas fir and Alaskan cedar richly line the interior walls, and the flooring is made of Vermont slate. In the kitchen and dining area, a group of Wishbone chairs by Hans Wegner for Carl Hansen & Søn surrounds a table by local furniture maker Larry Hepler. A Frank sofa and chaise by Antonio Citterio for B&B Italia furnish the main living space. The long tracking curtains are from JW Designs, and the leather Paulistano armchairs by Brazilian designer Paulo Mendes da Rocha are from Design Within Reach. An attentive sensitivity to site played into nearly every aspect of both the exterior andinterior spaces of the home. Architect Peter Rose collaborated with landscape architect Michael Van Valkenburgh, who worked to craft and maintain the wild, organic feel of the environs. Will Parry, a local builder, custom-fabricated all of the sustainably harvested Spanish cedar-and-glass windows and skylights throughout. Here, a vertical-swinging window at the end of the entry hallway opens directly to a lush expanse of vegetation. A palette of stone, concrete, and greenery greets guests at the home’s front entrance. Large windows and sliding doors with maximal operability are placed throughout, including the master bedroom, where expansive lift-and-slide mechanisms line three exterior walls. The room is furnished by a custom mahogany headboard and bed frame by Larry Hepler and a glass Murano lamp by Massimiliano Schiavon. A large skylight looms above a Duravit tub and a Runtal Radia towel warmer in the en suite bathroom. When husband and wife Tarek and Cynthia decided that their aging home on Martha’s Vineyard needed to be completely replaced, they began a long search for an architect who not only would deliver a successful collaboration, but also lived on the island. It was not a small order, but serendipity—and some sleuthing—eventually played its role. Upon inspecting the as-yet-unfinished house, she and Tarek found a box of tiles with architect Peter Rose’s name printed on it. Tarek called his office, only to discover that he and Rose would soon be flying out of Logan Airport in Boston on the same day. They agreed to meet at a terminal, and though Rose did not fulfill the island-resident prerequisite, the two immediately hit it off. Rose and his team decided to compose the house as a series of six modular structures connected by two intersecting corridors. Each of the six boxes can be lifted by crane; if the site becomes compromised, all that needs to be rebuilt is the foundation and the spaces between the modular units. With an eye toward accenting the site’s sweeping views and natural beauty, Rose designed the home with subtle, blurred boundaries between the exterior and interior while also taking measures to consider neighboring structures. “The modernity of [East House] sort of emerged accidentally,” he says, of the home’s low-slung profile. “There are two sets of rules on the Vineyard: If you do a vernacular house, you can build higher; if you build a modern house, it has to be lower.” Rose and his team opted for the latter, building a single-story structure with a series of flat, planted roofs, each topped with natural sea grasses. 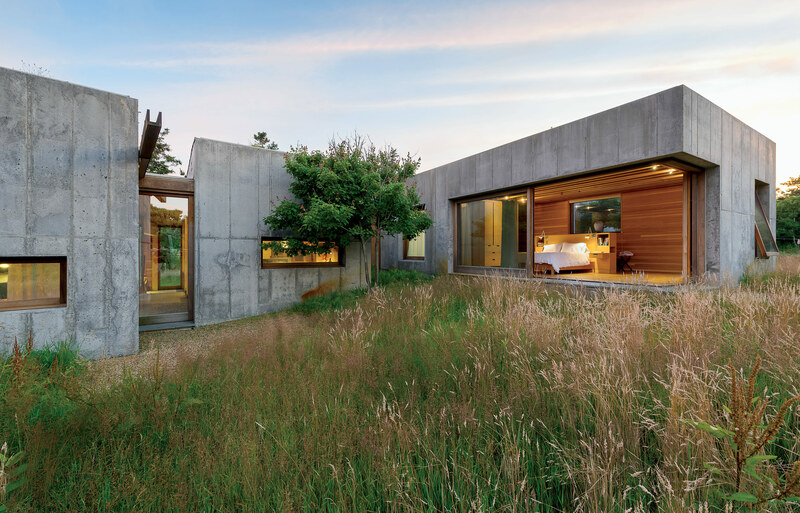 The region’s climate informed the choice of concrete for the home’s distinctively minimalist—and hardy—exterior. “As you get into later fall and winter, it’s a very unbearable place, so the placing of a very tough house in that landscape made sense to me,” says Rose. “The use of concrete was like placing a boulder onto the site.” Despite the practical durability of the building material, Cynthia was not convinced, at least initially. “It was my husband who convinced me that concrete could have more to do with the Vineyard landscape—the beach, the rocks, the fog,” says Cynthia, “rather than with an underground car park.” Indeed, the subtle tones and slightly textured surfaces of the exterior panels, modulated by expanses of glass and Spanish cedar window frames, create a sense that the house is at home in, rather than at odds with, the sweeping landscape amid which it sits. Rose’s reverence for the natural vitality of Martha’s Vineyard was also the impetus for integrating sustainable systems throughout the home: The planted roofs mitigate runoff while further integrating the building into the surrounding landscape. Rainwater is collected in the roofs, between the boxes, and directed via a copper-lined wood scupper to a belowground cistern, for use in irrigation. And geothermal wells provide radiant floor heating, which greatly reduces the size and cost of HVAC equipment.